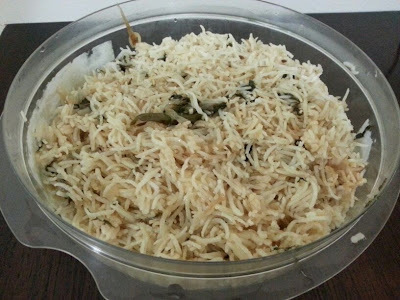 Bagaarya Chawal (Hyderabad) aka Bagaarya Khana (Chennai) is an easy and really tasty rice preparation which is an alternate to normal steam rice. My mother always made bagaarya khana paired with pudina chutney (mint chutney) and pyaaz ka anda (onion omlet) in addition to anything else she prepared. I prepare Bagarya khana in a slightly different way than my mother does and hence Bagaarya chawal :). I make Bagaarya chawal at least once a week and most of the times when we have guests over. I pair it with a basic mutton/chicken curry or pepper mutton/chicken curry or mutton/chicken khurma. 1. 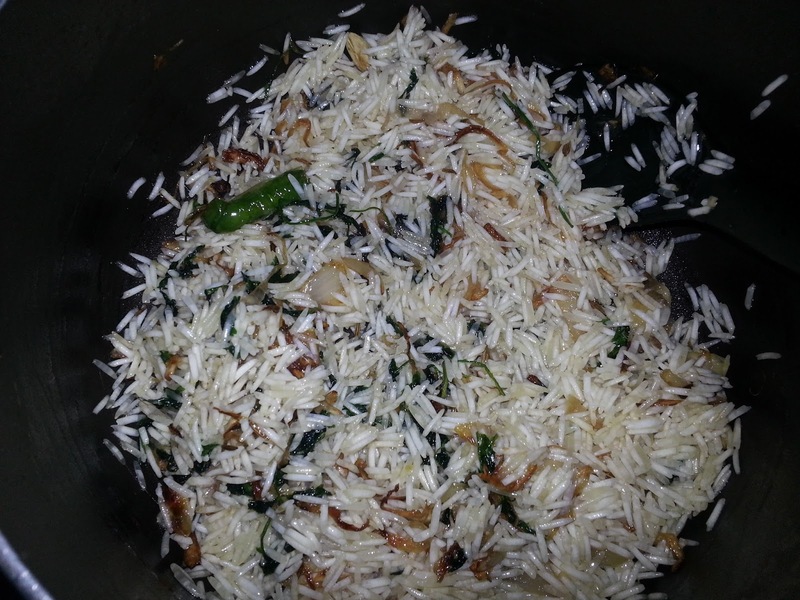 Wash and soak basmati rice in water. I always do this just before I start cooking. 2. 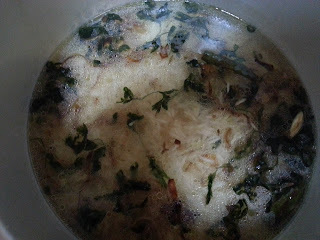 In a non-stick vessel, heat oil. 3. Add cloves, cardamom, cinnamon and caraway seeds. Fry it for a quick minute. 4. 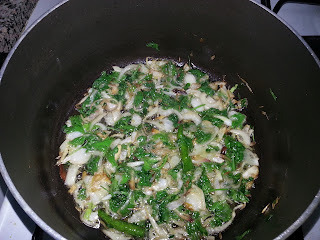 Add the onions and green chillis. Fry till onion turns translucent. 5. 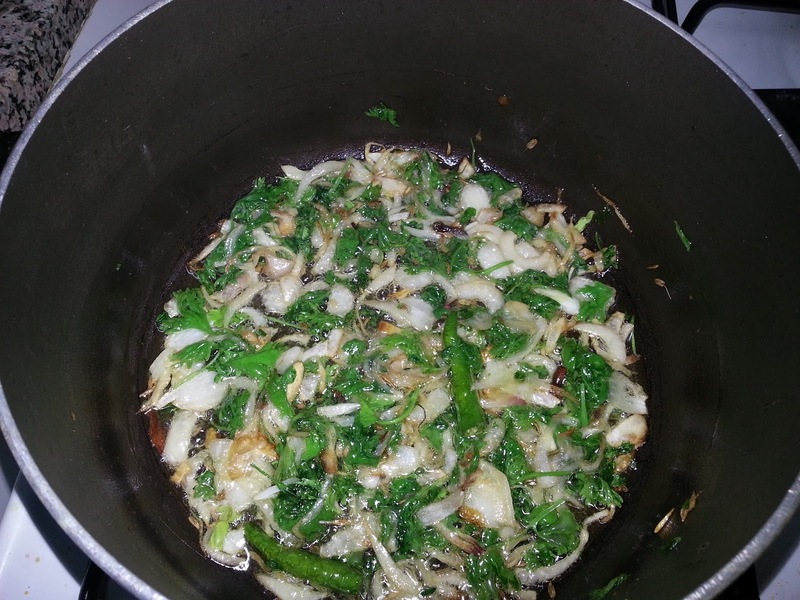 Add the chopped and washed coriander leaves. Keep stirring. I like to add them at this stage as it gives a different taste and flavor. You can add at the end as a garnish. 6. 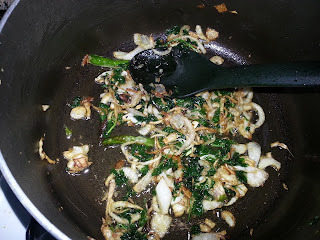 When the onion turns light brown, add ginger garlic paste and keep stirring to avoid burning. 7. I prefer the onions to turn dark brown as it makes the bagaarya chawal taste really good but you can do as you like. 8. 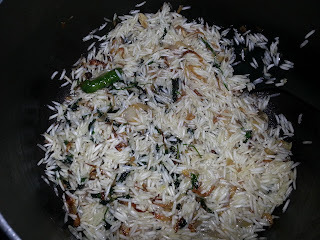 When the onion turns brown but not burnt add the rice without any water any give it a stir. Take caution not to break the rice while stirring. 9. I transfer the contents to a rice cooker at this stage and cook the rice with water in 1:2 ratio with some salt. 10. You can do so or continue to cook in the same vessel with water as required or even pressure cook.